This feature is available only for local installations (see the User Administration page) with user management system (UMS). A local installation administrator can become a local installation full administrator by sending a request to support@sketchengine.eu. The Sketch Engine support carries out the necessary UMS configuration. Full administration features are accessible in the left side submenu “Admin”. 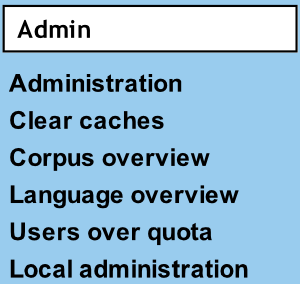 The UMS is accessible under “Administration” in the Admin submenu. Each user has a user profile containing information about the user (name, email, site, …) and user’s configuration options (available corpora, user corpora space limit, …). A user can be a member of a site (the user’s organization). The user configuration is inherited from the user’s site configuration (if exists). All inherited options can be overridden by setting user options. A preloaded corpus is a corpus not associated to a specific user, usually shared among more users. It also has configuration options. Preloaded corpora can be organised in preloaded corpora groups. Define all preloaded corpora first. Use category (access policy) “main” to grant access to all users or “restricted” if you want to grant access to selected users (or organisations). If some users work with groups of corpora, create corpora groups in the UMS. Set user’s configuration options in “Corpus Architect options” in the right pane in “CA users”. If organisations/sites are used, set user type to Site licence member and select the correct Site licence. The Corpora access dialog can be found in user configuration and site configuration in “Corpus Architect options”. It looks like two lists of corpora: available corpora on the left and accessible corpora on the right. Access can be granted by moving a corpus from the left to the right by selecting the corpus in the left box and clicking a right-pointing arrow. Access can be revoked by moving a corpus from the right to the left. Type into the filter box above the list of available corpora to filter corpora by name. Groups of corpora look like same. Over the plus symbol, you can add other groups to the list of available groups of corpora. Which corpora are accessible by a certain individual/site user? Other users’ own corpora shared with the user.